City voters could decide in June whether to borrow nearly $1 million to replace Stackpole Bridge after rejecting a more expensive restoration proposal last year. Saco voters could face a June vote about the future of Stackpole Bridge, a historic span that has been closed to traffic for the past year. The City Council voted unanimously Monday to ask voters to approve a $990,000 bond to remove and replace the bridge. A public hearing will be held April 7, with a final council vote to follow. That cost estimate is based on the removal of the existing stone bridge and installation of a pre-cast concrete modular bridge. The vote would come a year after residents rejected a plan to borrow $1.7 million to keep and restore the original bridge, which was built in 1848 and is one of the oldest stone bridges on a public roadway in the state.Last June, voters rejected the restoration project by a vote of 971-742. The bridge, which carries Simpson Road across Stackpole Creek, will remain closed to traffic until it is repaired or replaced. 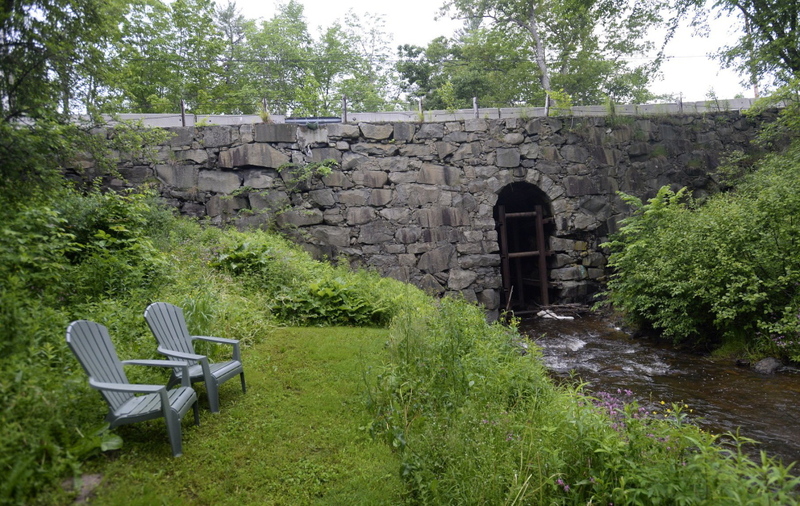 The small stone bridge is eligible for National Historic Preservation status and was included on Maine Preservation’s 2013 list of the state’s most endangered historic properties. The bridge is remarkable for its vaulted arch, which is shaped like a giant keyhole and rises 21 feet over the creek. Traffic on the bridge has been reduced to one lane for years, but was closed altogether last April because of concerns about its stability, said Patrick Fox, the city’s public works director. The city approached the Maine Department of Transportation in June about funding assistance for the bridge, which is located in the more rural section of Saco. The department offered Saco use of a low-interest loan program to cover up to half of the cost of replacing the bridge, or a maximum of $650,000. Fox said city staff has worked since last June to come up with design alternatives that would provide a fully functional bridge for a lower cost. He estimated it will cost $990,000 to fully replace the bridge, but said there is still a possibility the City Council could decide to pursue restoration instead of replacement. With the old bridge out of commission, about a mile of Simpson Road between the bridge and the Buxton border has been cut off from the rest of Saco for the past year. It is about a seven-mile detour into Buxton to reach that stretch of road, so Buxton Public Works agreed to plow it this year. Mutual aid agreements with Buxton that were already in place are used when there are emergencies in that area, Fox said. If voters approve a bond for the bridge, Fox said city officials would move quickly to finalize a design and get the proper permits so the city can resume its own plowing and emergency response for the section of Simpson Road. “The sooner we can get back to that, the better,” Fox said.